Despite steadily increasing urgency about the nation's lowest-performing schools -- those in the bottom five percent -- efforts to turn these schools around have largely failed. Marginal change has led to marginal (or no) improvement. These schools, the systems supporting them, and our management of the change process require fundamental rethinking, not incremental change. The Turnaround Challenge is part of a larger, multi-phase initiative of the Mass Insight Education & Research Institute, funded by the Bill & Melinda Gates Foundation. The initiative is aimed at helping states, districts, schools, and partners to successfully address the issue of chronically under-performing schools -- and to use failing school turnaround as the entry point for fundamental change more broadly in public education. The full report, supplemental report with profiles of intervention efforts in ten states and four districts, and related resources can be found at Mass Insight Education. The Turnaround Challenge reflects the ideas and contributions of well more than 50 organizations and individual experts, over its two-year development process. Dave Lash served as strategy and innovation consultant on the study, helping develop the conceptual models and frameworks for action as well as the visual explanations contained in the report. In particular, Dave played the lead role in reviewing available research on the linkages between poverty, human development, and student achievement. These linkages have received extensive research attention for over forty years, as have the small but growing number of high-performing, high-poverty (HPHP) schools who transcend them. 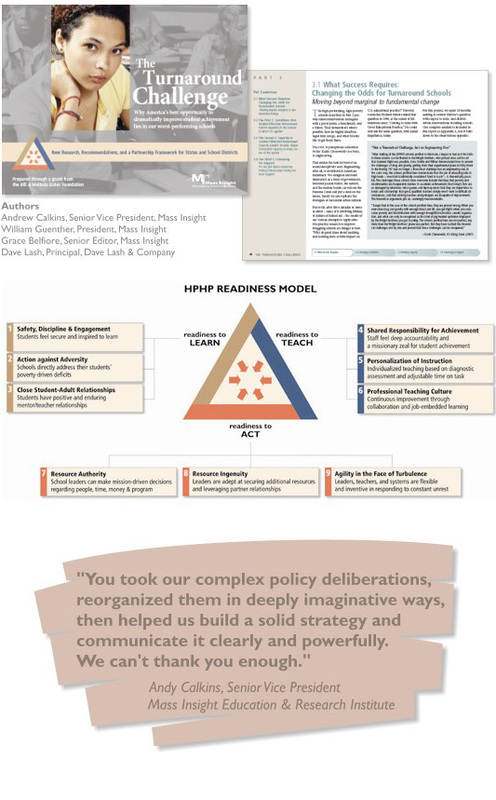 Applying an innovation, rather than a pedagogical, perspective, Dave helped develop the High-Performing, High-Poverty Readiness Model that identifies nine strategies that address the daily turbulence and challenges of high-poverty settings, serving as design factors that increase the effectiveness with which these schools promote learning and achievement. These strategies enable the schools to acknowledge and foster students’ Readiness to Learn, enhance and focus staff’s Readiness to Teach, and expand teachers’ and administrators’ Readiness to Act in dramatically different ways than more traditional schools. Over 200,000 copies of The Turnaround Challenge have been downloaded and the recommendations are widely studied and implemented throughout the country.